FoodThoughtsOfaChefWannabe: Grossest Halloween Meat and Cheese Party Platter EVER! 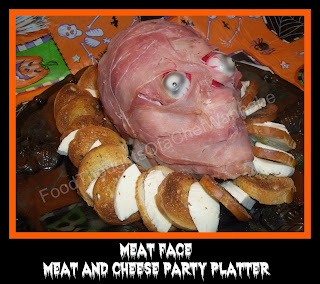 Grossest Halloween Meat and Cheese Party Platter EVER! This has to be one of, if not THE most fun thing I have done with food. I have no clue where I saw this, but it was probably 2 or 3 years ago and I have wanted to recreate it since. I finally did it. My husband and I were engaged and not wanting anything big, we went to get our marriage license and the next open date to get married by the Mayor (who was also a minister) was Halloween. I was going to try and bargain for a different date but when my husband gives me the "COOOOOOLLLLLL" and looks as excited as a little boy getting his first puppy I just agreed. I flip flop over whether I am mortified my anniversary is on Halloween or I think it is cool. My mother will never recover from me wearing a charcoal gray (BLACK) suit to get married or that I had Frankenstein and the bride of Frankenstein on my wedding cake. That being said, we vowed every year we would hold a Halloween party, a tradition that would go on and on and on. We have had 1. LOL We are celebrating 10 years of marriage this Halloween and we have had 1. (heavy, not surprising, sigh) Seems when I plan things they don't generally get executed (HA, good Halloween word). It will happen, I swear it WILL happen! So I know many of you will be attending Halloween parties. This platter will be a HIT for kids and adults alike. It is delicious but yet, so gross it takes a minute to actually peel the "skin"/meat from the skull and put it on a piece of crostini! You will and you will "eewwwwww" over it the whole time! I have a couple of things to discuss. Someone help me solve this mystery. Is there a reason ham isn't pink anymore? Seriously? I don't get it. I used prosciutto for the top and ham underneath because the prosciutto was pinker and more real looking. Prosciutto admittedly is pricey which is why I did it this way. It is a variety of meat, but more economical than 1 or 2 pounds of prosciutto. The best ham to use is the very inexpensive boiled ham at your deli counter, it is the pinkest! Remember we are looking for something that looks real here! You know that meat that is pressed and really thin sliced in a package, I think Carl Buddig is one brand, those would work REALLY well because they are so thin. Make sure you ask for your meat VERY thinly sliced, it is key. If you get large pieces of meat, cut them into a size suitable for your bread and cheese bites! As far as cheese, pick what you like. I go to fresh mozz for everything because I love it but use any cheese you like as long as it is in little enough pieces to fit on your slices of crostini! You could add cherry tomatoes to this, or olives, anything you want! Here is what you need for my Meaty Skull Platter! Take your skull, and wash it. I did it just because even though it will be covered I just had to wash it first. Cover it with your saran wrap/press and seal, making sure to leave room to push in where all the indention's in the skull are. This is just a protective barrier between the plastic and food. Slice into THIN slices. Lay out on a cookie sheet, drizzle with olive oil, salt, and a little dried Italian seasoning and broil just until the tops are golden brown. I ALWAYS burn the bread, don't be me. Slice into pieces about the size of your crostini. It makes no difference what shape they are, you just need enough to alternate with the bread in a "collar" around the skull. This also helps keep his head and the bottom meat stay in place. Back to the skull. Whatever meat you choose, if you use 2 meats, pick the pinkest one to go on the OUTSIDE of the skull. Start layering your meat to cover the skull. When you get one layer down, put the eyeballs in the sockets or on top of the sockets and use the meat to keep them in place. Mine had blood on the bottom so they had a flat part I could layer a piece of ham right over! Do this until all of your meat is used. Remember you choose the size skull and amount of meat you need according to how many you need to serve. Mine served 6-8 very well. (as an appetizer) If you are using this for a party where the food IS the meal, do a bigger skull and maybe 2. Maybe one should get a little veil and one get a bow tie? You will need to press the meat down to get it to kind of stick to the other meat. At the bottom it will hang off the skull until you get the bread and cheese around it. Just alternate a ring of cheese and crostini all the way around. Next time I would probably not cover his teeth up, or I would add some lips for fun! He is creepy for sure and in the most perfect way for a party! Just keep a fork on the platter so everyone can "peel" off a piece of meat!! Enjoy this GROSS yet FABULOUS party platter!! PS. I think he needs a name....it is only fair, right? I am your new follower…. Thank you so much Carrie! I am thrilled you liked it enough to share it with your own readers! You rock!